Cardi B stole the show in her Pepsi commercial on Superbowl Sunday. Another Cardi – Pepsi collaboration debuted on Thursday. 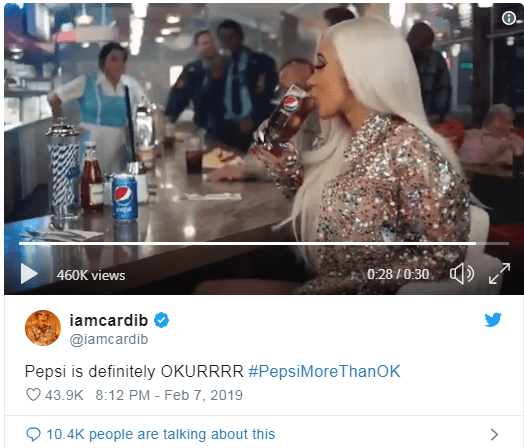 The commercial has the same general theme as the first with someone asking if Pepsi is ok. Cardi jumps in and says it’s Okurrr. People in the restaurant try to pronounce the signature line. Some pigeons outside even get in on the act. The commercial is scheduled to air during Sunday night’s Grammy Awards. Can you do Cardi’s Okurrrr? You should have a game to see who can do it the best!